Intro to TRX by appointment only. Silver Sneaker Classic Meets Prime Time! Beginning May, 2019, Prime Time and Silver Sneaker Classic will COMBINE into ONE class, offered on Mondays @ 9:30am! New classes beginning April include: Body Sculpt, Bootcamp, HIIT Cardio, Indoor Cycling, and a Low-Impact Endurance Circuit! New classes beginning the week of May 20th, 2019 include: Beginner Running ("RUN01"), Intermediate/Advanced Running ("Elevate")*, and Intermediate Weightlifting ("Stacked")*! *Please review recommended fitness requirements for "Elevate" and "Stacked" below, under "Class Descriptions." These guidelines are to ensure your safety and enjoyment. HIIT2FIT & Beginner Weights On The Move! Beginning the week of May 20th, 2019 HIIT2FIT will move from Mondays to Tuesdays at 5:30pm, and Beginner Weights will move from Tuesdays to Thursdays at 12:00pm! Sport your red, white, and blue and join the party! Have you been thinking about taking a fitness class, but unsure about what all is involved? Now is the time to give them a go! Classes are subject to cancellation if they do not fill. Refunds will be issued if the class is cancelled. unless you complete the Kroc Teen Programs. Drop-In Rates: $3 members, $5 non-members per class. 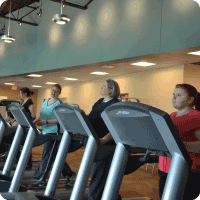 There is a minimum of 5 participants for each class to run. TRX capped at 9 participants/ Cycling capped at 7 participant, so please sign-up early! Purchase a punch card and use it on any 12 classes on any day! You must have the punch card present at the time of the class. Get (8) 1 hour personal training sessions and 8 aerobic classes of your choice for one low price of $150 for members $300 for non-members. This class is for anyone age 16 & Up. Using only suspension training straps and gravity, build muscle, flexibility, and core strength all at the same time. With the dozens of TRX exercises you can experience a total body workout on one simple piece of equipment. Maximum number of clients is 9 so please sign up early if interested. This class will fill quickly. This class is for anyone age 16 & Up. Zumba is a fun class filled with easy dance steps that correspond with Latin and International music. Aerobic interval training is combined with fast and slow rhythms. Zumba utilizes the principles of fitness interval training and resistance training to maximize caloric output, fat burning, and total body toning. This 45-50 minute class is for anyone ages 16 & Up. This class is designed to push your physical limits, alternating periods of high intensity work with periods of rest; also called High Intensity Interval Training, or HIIT. This class uses a variety of exercises to boost your metabolism, burn fat, and build your cardiorespiratory and muscular endurance. This 45-50 minute class is for anyone ages 16 & Up. This class follows a high-repetition/low-weight model, designed to tone or "sculpt" your entire body and improve your muscular endurance. This 45-50 minute class is for anyone ages 16 & Up. Similar to HIIT, these classes are designed to push your physical limits by blending high intensity work with periods of rest. These classes feature a variety of exercises to boost your metabolism, burn fat, and build your cardiorespiratory and muscular endurance. This 45-50 minute class is for anyone ages 16 & Up. This class follows a variety of formats, combining low-impact cardio with light-weight exercises, designed to burn fat and enhance your cardiorespiratory and muscular endurance. This 30-50 minute class is for individuals, ages 13 & up, looking to begin a distance running regimen. We will blend education with a variety of training methods to start you off on the right foot! It will primarily (if not entirely) be an outdoor class, so dress for the weather accordingly. Pace will vary, but will predominantly follow a walk-run model. Distance will be participant and workout dependent. This 45-60 minute class is for individuals, ages 16 & up, looking to improve their distance running performance. We will blend education with a variety of training methods to better your best! It will primarily (if not entirely) be an outdoor class, so dress for the weather accordingly. Pace and distance will be participant and workout dependent. It is recommended that participants be able to cover 2 miles in less than 20 minutes prior to taking this class. This is a 45-60 minute class is for individuals, ages 16 & up, ready to raise the bar on their current weight routines! This class will use a variety of weight training models, shifting from endurance/toning and hypertrophy (improving muscle size) to muscular strength and power. It is recommended that individuals already lift at least 2 days per week prior to taking this class. Class size will be limited, so arrive early! This class is for seniors age 55 & Up. Just the basics--no sun salutations or human pretzel poses! You can practice seated poses in a chair or on a thick padded mat. We’ll do a lot of breathing exercises, go through a full range of motion, and practice both visualization and meditation. This class is for anyone 16 & Up. Gentle Stretch consists of flowing, non-strenuous movements, to gently stretch skeletal muscles, relax the nervous system and add a little flexibility and balance to your day. We'll move slow through the basics while using breathing techniques and guided relaxation to help the body feel refreshed and rejuvenated. This class is for anyone age 16 & Up. Cycling is a great, low-impact cardiovascular workout. Pedal through hill climbs, sprints, and many other challenging drills and exercises. All levels are welcome. Remember to bring a towel and water bottle! This class is for anyone ages 16 & Up. Just the very basics, adapted to your present mental and physical abilities. You can practice yoga using a chair, wheelchair, and/or a padded mat. We will focus on core strengthening, stretching, balance awareness, breathing, and mindfulness to improve vitality, clarity, flexibility, overall well-being and peace of mind, body, and heart.